Providing thermal comfort without excess space conditioning costs is one of the primary requirements of buildings. Therefore, thermal control is an important aspect in almost all buildings. Understanding heat transfer and the temperature distribution through building materials and assemblies is also important for assessing energy use, thermal comfort, thermal movements, durability, and the potential for moisture problems. 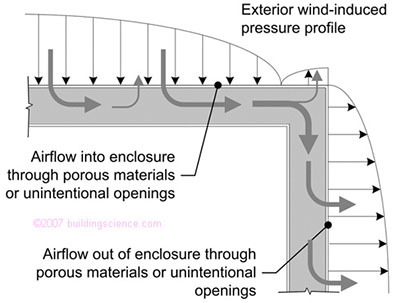 Heat flow occurs through the building enclosure via opaque enclosure elements, is directly transferred into the building by solar radiation through windows, is carried along with air across the enclosure by unintentional leakage and ventilation, and can be generated within the building by occupants and their activities. The control of heat flow in buildings requires insulation layers compromised with few thermal bridges, an effective air barrier system, good control of solar radiation, and management of interior heat generation. Heat flow can be a transient or a steady process. In the transient state, temperature and/or heat flow vary with time. Steady-state heat flow occurs when the temperature and heat flow reach a stable equilibrium condition that does not vary with time. Depending on the particular problem, the assumption of steady-state conditions may provide sufficiently accurate predictions of actual heat flow and temperature conditions. However, for some problems the assumption of steady flow can result in significant errors. Heat flow can occur in one, two, or three dimensions. In almost all real situations, heat flow occurs in three dimensions but, from a practical point of view, it is often acceptable to simplify considerations to only one-dimensional, or series, heat flow. Changes in moisture state, although not strictly an energy transfer mechanism, must also be considered since these state changes absorb and release heat energy, i.e., latent heat. Conduction is the flow of heat through a material by direct molecular contact. This contact occurs within a material or through two materials in contact. It is the most important heat transport mode for solids; it is sometimes important for liquids, and it is occasionally important for gases. Convection is the transfer of heat by the movement or flow of molecules (liquid or gas) with a change in their heat content. This is an important heat transfer mode between fluids and solids, or within fluids. Radiation is the transfer of heat by electromagnetic waves through a gas or vacuum. 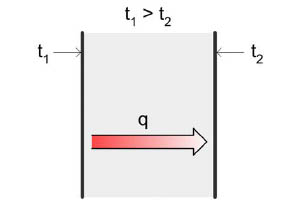 Heat transfer by this mode therefore requires a line of sight connection between the surfaces involved. All objects above absolute zero radiate heat energy; it is the net radiative heat transfer that is the heat transfer of interest. Radiation is mostly of importance for heat transfer between solids and within highly porous solids, but radiation between high-temperature gases is occasionally of practical importance. State change, sometimes called phase change, occurs at a constant temperature but still entails the movement of energy. For example, evaporation absorbs energy and condensation releases energy. This energy is sometimes called latent heat. The mode of heat transfer often changes during the process of heat flow through and within building systems. For example, the sun transmits heat by radiation to the earth, where it can be absorbed, for example, by a brick wall. The heat is then transferred by conduction through the brick and transferred to the indoor air by convection and to the indoor surfaces by radiation. All materials and layers in a building assembly have some resistance to heat flow. However, some materials with a k-value lower than about 0.05 to 0.07 W / m ∙ K are deliberately used in building assemblies for their ability to retard the flow of heat. These building products are called thermal insulations. Insulations are usually solid materials (so-called body insulation), but radiant barriers that control only radiation heat transfer across air spaces are also available. Since conduction is a major mode of heat transfer and still air is a low-cost insulator, insulation products tend to be low-density materials (i.e., porous materials with a large proportion of voids filled with air) and / or made of low-conductivity elements. For example, glass of 2500 kg/m3 density and 1.0 W/ m ∙ K thermal conductivity is spun into fibers and formed into a batt of about 16 kg/m3 density and 0.043 W/ m ∙ K thermal conductivity. Fiberglass batt insulation is widely used as insulation despite the high conductivity of glass because of the very high percentage of pores filled with air. This type of thermal insulation is approximately 99.4% air. Foam plastic insulations have a lower percentage of air voids than glass fiber batts, but are made of lower conductivity plastic material. Soft wood of 500 kg / m3 density and 0.11 W/ m ∙ K thermal conductivity is produced to produce cellulose insulation of 60 kg / m3 density and 0.042 W/ m ∙ K thermal conductivity. Most materials with high strength have relatively high density, and the strength of most building materials (e.g., concrete, wood, plastic) drops along with drops in their density. Hence, the need for low density (or more accurately, high porosity) reduces the structural capacity of most insulation. Accordingly, low-density insulation layers -- such as glass fiber batt, and foamed plastics -- are used to control heat flow in most modern building enclosures, while high-density, high-strength, high-conductivity materials such as steel studs, and concrete are used to support structural loads. In the past, building materials such as adobe, log, and low-density brick were used in a manner that combined both moderate insulating and acceptable load-bearing functions. Buildings constructed of these materials had thick walls, both to provide a reasonable level of resistance to heat flow and to provide sufficient strength. Within porous insulations like fibers and foams, all three modes of heat transfer actually occur simultaneously. At low densities, the effective conductivity is high since convection and radiation can move heat through the relatively open space. At high densities, convection and radiation are suppressed, but conduction through the increasing proportion of solid material becomes important. Therefore, an optimum density can be chosen: one that varies with the type of material. For glass fiber A (a very fine glass fiber), the optimum density is about 2 pounds per cubic foot (30 kg/m3.) However, since the cost increases as more material is used, the density of glass fiber batt is more commonly less than 1 pcf (15 kg/m3). If higher strength is required (as it is for low slope roof, curtainwall, and exterior basement applications), higher density fibrous products of 3 to 8 pcf (50 to 125 kg/m3 density) are available. Foam plastic insulations provide better R-value if higher strengths are needed. For example, extruded polystyrene with a density of only 2 pounds per cubic foot can easily resist pressures of 10 psi (or 1440 psf). The wide range of values for thermal conductivity, and the inverse relationship of strength to thermal resistance, may be appreciated from the thickness required to achieve a certain level of thermal resistance. 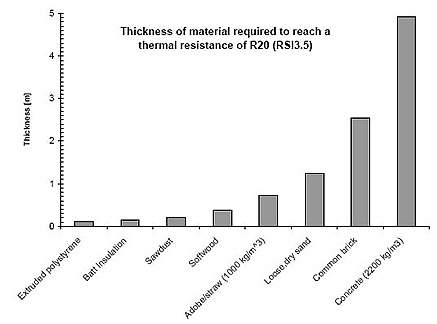 Figure 3 is a plot of the thickness of various building materials required to achieve a thermal resistance of RSI3.5 (R20). Rockwool fiber is thicker than glass (since the spun rock contains more impurities than glass), and hence conduction plays a larger role at lower densities. Rockwool products therefore tend to use higher densities to achieve the same thermal performance as spun glass. This extra density provides these products with greater strength and more resistance to convection and radiation effects. Even though more material is used for the same thermal resistance, rockwool products compete in applications that require these properties. Thermal bridging can severely compromise thermal control and comfort in some building types. Heat flow through steel stud walls and metal curtainwalls is dominated by heat flow through the metal components. Failure to break these thermal bridges can reduce the R-value of the insulating components (the insulated glazing unit or batt insulation respectively) by 50 to 80%. Filling the voids in concrete block masonry with insulation is not very effective: adding R15 insulation to a 12” block with increase the R-value of the wall by about R2. 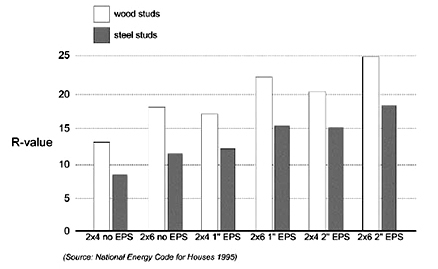 Wood framed walls are not as badly affected, but reductions of 10 to 20% are common. A separate BSD discusses thermal bridging in more detail. The ground temperature under and next to a building is generally very close to the annual average temperature. This means that the temperature difference between the inside of most buildings and the ground is not that large, although it is much steadier. Hence, less insulation is needed to control heat flow to or from the ground. 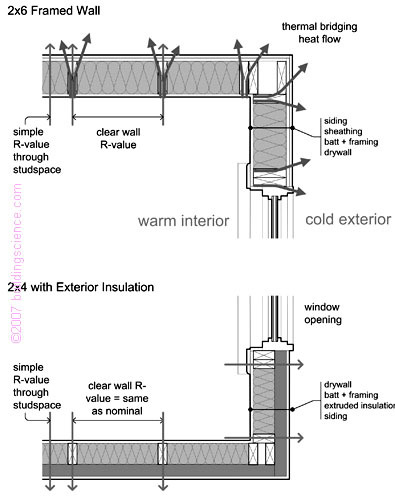 Nevertheless, some insulation is still required in many climates zones (DOE Zones 3 and higher). In many cases, heat flow control for slabs, crawlspaces, and basements is limited by that needed for control of moisture and comfort problems, not energy. If cold air leaks out of the building during cold weather, it is of course replaced with cold air. This cold air must be heated up to make it comfortable. In warm weather leaking air is replaced with hot air that needs to be cooled and dehumidified. The energy impact of air leakage is significant and must be considered since it is often an important heat loss/gain component of modern buildings. For example, air leakage can account for 30% of the thermal flow across the enclosure in a well-insulated modern home. The use of a complete air barrier system is required to prevent unintentional air leakage. Several BSD’s and Guides address this critical issue. Airflow can reduce or bypass thermal insulation in other ways than by just flowing across the enclosure. 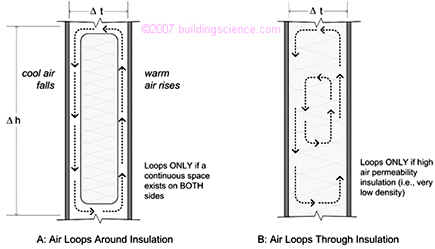 Convective loops can form within highly air permeable insulation (low-density fibrous insulations) or small gaps around insulation (possible with rigid board insulation or improperly installed batts. Intentional ventilation has the same energy penalty as the same quantity of unintentional air leakage. Hence, the amount of ventilation should be no more than needed (see ASHRAE standards for guidance). In extreme climates, much of the energy required to heat/cool ventilation air can be recovered in heat recovery ventilator. Energy recovery ventilators also reduce the impact of humidity. Solar gain through windows exposed to either the direct sun, or reflected sun (reflected off the particles in the sky, creating diffuse radiation, or reflected off a surface) can dramatically affect the heat flow in a building. Hence, the building energy flows must account for the solar gain through windows. This amount of heat can dominate the performance of a modern building with relatively high window coverage (i.e., above 20 to 30% window to wall ratio). The Solar Heat Gain Coefficient (SHGC) is the window property used to rate the amount of energy allowed through windows. The SHGC is the fraction of incident solar radiation that passes through a window and becomes heat inside the building. For example, if the SHGC of a glazing unit is 0.50, and the sun is shining on the window with an intensity of 500 W/m2, 250 W/m2 will enter the building. The lower the SHGC, the less solar heat that the window transmits through and the greater its shading ability. 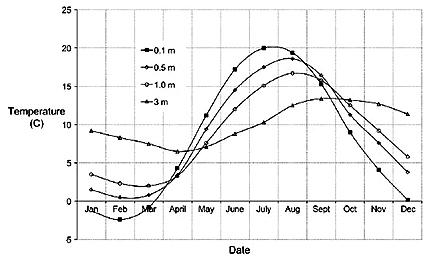 In general, south-facing windows in houses designed for passive solar heating (with a roof overhang to shade them in the summer) should have windows with a high SHGC to allow in beneficial solar heat gain in the winter. East or West facing windows that receive large amounts of undesirable sun in mornings and afternoons, and windows in houses in hot climates, should have a low SHGC. Solutions to control this form of thermal control include reduced window area, projecting horizontal shading (most effective on the south), exterior operable vertical shade, and solar control coatings on windows. Interior shades have a relatively small impact, but have the important role of controlling glare and providing privacy. Passive solar heating design is used to capture the heat of the sun in a beneficial manner—this requires that most of the windows face south, and that window area be limited to collect only as much energy as needed for heating and to warm storage. Modern passive buildings have better control of the thermal losses in cold weather and hence have almost normal ratios of window to wall area. In a well-insulated building, the interior heat generated by occupants and activities can be quite important. In cold weather, this interior heat offsets the heat required to warm the space. In warm climates this heat adds to the cooling load. In smaller buildings (or buildings with a large enclosure surface area to interior floor area ratio) such as housing, interior heat gains do not play a large role in most cases. Only in very well insulated homes or mild heating weather (i.e., around 10 ºC or 50 ºF) do interior heat gains form a significant proportion of heat flows in a small building. Large boxy buildings (that is, those with a small ratio of enclosure surface area to floor area) are often dominated by internal heat gain. Thermal flow in properly insulated commercial office buildings generally is dominated by heat gain and loss through windows at the perimeter (that is, within about 30 feet of the perimeter) and by interior heat gains in the core. By employing moderate areas of high performance (U<0.3 or 1.25 W/m2ºC) windows in a well insulated opaque enclosure, many commercial buildings will require little or no heating in below freezing weather when occupied. This is just a summary introduction to the large topic of thermal control. Various Building Science Digests discuss specific topics of insulation, air barriers, ventilation, passive solar design, glazing, and thermal bridging. Despite the many specific situations that will arise in the building industry, it can be generally concluded that the control of heat flow in buildings requires insulation layers penetrated with few thermal bridges, an effective air barrier system, good control of solar radiation, and management of interior heat generation.